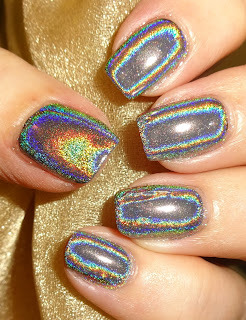 I have the most amazing holographic nails to show you using pigment powders from Nicole Diary. I've been in awe of YouTube demonstrations showing the pigment applied to cured gel nails. I don't often wear gel polish, preferring regular nail polish as I change my nail colour daily. However when Nicole Diary asked me if I'd like to try the holographic pigment I jumped at the chance. I already had a gel base coat and purchased a no wipe top coat from Ebay for a few quid. First I applied a peel off base coat for easy removal of the gel polish. I then painted and cured a clear gel base coat, painted regular black nail polish, applied and cured a no wipe gel top coat and then the fun began. The 1g pot of holo pigment comes with a sponge applicator, I used a very small amount using the sponge applicator and rubbed onto my nails. The holographic magic took seconds to appear, truly amazing and mesmerising. I applied another layer of gel top coat to seal in the holographic pigment. And unlike holographic nail polish where the holo usually only appears under bright light or sunshine, the holo pigment can be seen regardless of how light it is. I can't stop looking at my nails, I love the effect and it was much easier and more impressive than I imagined.